Palermo waits its most important event ever, the festival par excellence, a moment that represents the union between the sacred and the profane, between devotion and entertainment, the concentrate of the real “palermitanità”: in short, the legendary Feast dedicated to Santa Rosalia , the “Santuzza” patron of Palermo. The “Fistinu”, despite its name that seems almost a term of endearment, it really is a great party, which is attented by all the Palermitans hoping Santa Rosalia will do miracles, as she did during the plague of 1624. In Palermo, the saint is celebrated since 1625: at that time, no one could defeat the Great Plague, nor the science, nor the saints. One day the soap-producer Vincenzo Bonello, who had buried his young wife, had in Mount Pellegrino the apparition of Rosalia, a hermit of noble birth who had lived around 1100, which showed him where to find her remains (in the cave where there is now the picturesque shrine dedicated to the saint), and asked him to bring them in procession to Palermo to halt the plague. This operation had positive results, the plague ended, and since then every year Palermo celebrates its patron since July 10th to 15th, with great pomp. It soon began the tradition preparing a large vessel-shaped wagon and other smaller ones, with allegorical figures showing that the defeat of the plague, a symbol of good triumphing over evil. Every year there is always a great expectation of the new wagon, of the “games of fire” and of the moment when, during the procession, the mayor of the city shouts: “Viva Palermo and Viva Santa Rosalia!”. The festivities begin as early as July 10th. At the Foro Italico, a popular promenade in Palermo, stalls decorated with images of typical Sicilian carts are set up and beautiful illuminations decorate the roads. The most awaited day, July 14th, begins the procession, which turns into a real theater, with music and dances. It Starts from the Cathedral, it goes through the Quattro Canti and all the Cassaro until the Foro Italico, where the people will be amazed by the spectacular fireworks which will last one hour and will leave the entire audience breathless. I happened a few times to participate in this event. The impact is incredible, a human tide flows directly to the Foro Italico, the whole city is blocked, the machines are left even in the middle of the roads, it seems an exodus, thousands of people try to reach a place from which to see good fireworks and, while waiting, they eat all that can be found in many traditional stalls, because in Palermo every occasion is good to reward the stomach. All the people like to eat “calia e semenza”, the leisure preferred by Palermitani. From semenzaro you can buy a “coppitello” (a container created by wrapping the paper itself) filled with roasted chickpeas and pumpkin seeds with salt, and you begin to devour them and throw the peels on the floor. The semenzari also sell other delicious and the choice is wide for the greedy: pistachios, peanuts, peanuts, cruzziteddi (chestnuts), luppini (lupines boiled), broad beans. There’s a variety of confectionery ingredients such as caramelized sugar and “cimino” (sesame), almonds, hazelnuts, sugar and cinnamon donuts, the “cubarda” (sweet hard sugar sold in chunks), “gelato di campagna” (a sweet sugar, pistachio and strawberry essence, with the color green, white and red, echoing the famous ice cream called “giardinetto” invented for the arrival of Garibaldi). The most suitable fruit for the event is “u muluni” (watermelon), that should be eaten with hands before “washing” one’s whole face and ears with its water, and of which all the seeds can be spat. 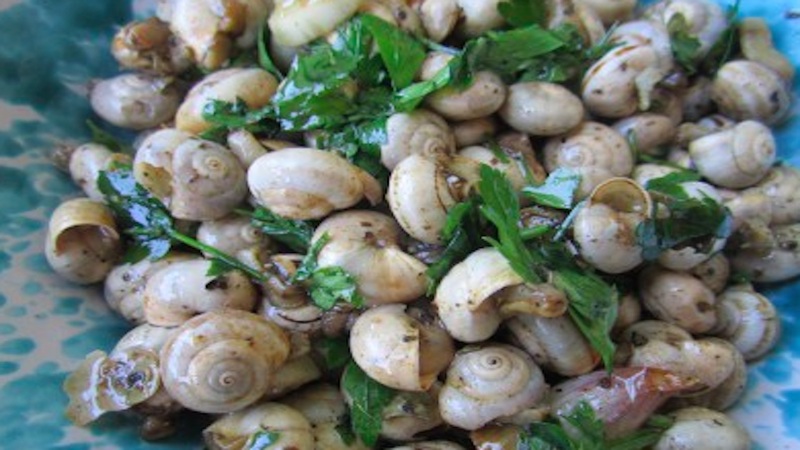 But the most typical specialty of the day, that is a perfect mix between eating and pastime are the “babbaluci”, snails seasoned with olive oil, parsley and garlic: they are sold in baskets, served in plastic plates and eaten with a “scrusciu” (noise given by the necessary suction), throwing the snails with a lot of satisfaction of the lovers of this sort of gastronomic ritual. The more fascinating image you can enjoy by participating in this event is one of a series of small extravagant tables, because to enjoy the fireworks while munching everything listed above you need to find a place of honor, a sort of throne raised, not to find as it happens to the cinema, someone taller to stop you from enjoying the show. Not everyone can afford a place on the beautiful terrace of Palazzo Butera or other palaces, where only the elite of Palermo can access, but the talent is also granted to the so-called “common people” who are allowed to set their tables on motoapi, on vans, trucks and anything that can guarantee a good vision. During the feast, in addition to food, there is also the chance to meet, to fall in love, but above all to fight. You can invoke the Holy and expects a grace. You drink wine, play cards, scream, chat and throw any waste on the ground. Then finally comes the most awaited moment: “i botti”, the fireworks. Several companies will compete with each other, it is a magic of colors, of loud noises, of hearts that beat wildly, of stares at the sky. Suddenly the shouting of the people stops altogether, listening to an almost deafening din; the excitement is palpable, adults and children are united by a sense of wonder and a moment of tension similar to an electric shock, that perhaps allows people to forget for a moment the daily tragedies, unemployment, poverty, lack of houses, harassment, family disputes, until the “masculiata”, which is the moment of greatest intensity of the barrels, followed by an instant of deafening silence, when everyone knows that there will be a very strong last thunder, finally dropping in a liberating applause: the party is over and life begins again.